The Rock has officially ruled out running for president during the 2020 election. 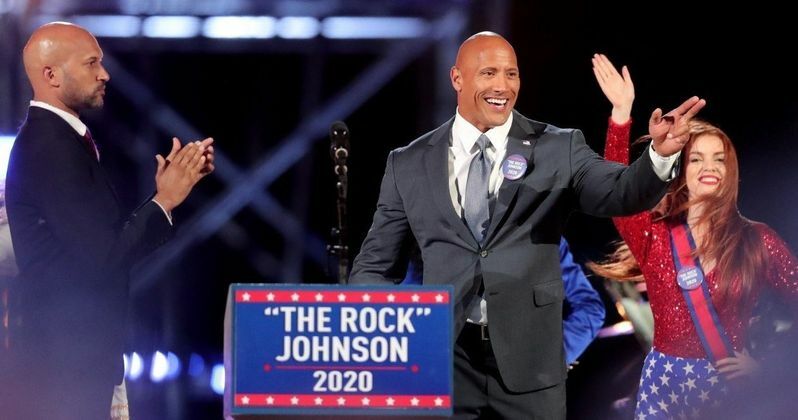 The idea of the wrestler-turned-actor possibly running for president of the United States was first floated in 2016 and Dwayne Johnson began taking the idea seriously not long after. Johnson hasn't definitively ruled it out in the future, but 2020 is definitely off the table. Dwayne Johnson has been promoting his latest movie Skyscraper, which is one of few original blockbusters hitting theaters this summer. During a recent interview, he was asked about possibly running against President Trump in 2020. Even though he ruled it out, one has to respect his reasoning as he appears to be taking the idea very seriously and doesn't want to do it unless he's absolutely prepared. "Unfortunately I don't see it happening in 2020. It's a position that requires years of hard work and experience to learn the skills. There's a lot of ground to cover, and due to my schedule, it's not possible in 2020. I have so much respect for the position. It's something that I seriously considered. What I need is time to go out and learn." Time is something that the man simply doesn't have much of right now. He's currently shooting Disney's Jungle Cruise, which arrives in theaters in October 2019. Then he's off to shoot the Fast and Furious spin-off Hobbs and Shaw with Jason Statham and then he's off to film the sequel to Jumanji: Welcome to the Jungle. He's also got the original thriller Red Notice with Gal Gadot dated for 2020, in addition to a slew of other projects, such as the Black Adam movie for DC, in development. That should leave Dwayne Johnson little time to sleep, let alone run for president. Many may consider the idea of Dwayne Johnson running for president a bit silly. Though, Arnold Schwarzenegger, another very famous action movie star, was governor of California for two terms and Donald Trump was a reality TV star before winning the presidency. So it is really that crazy to think The Rock could make a similar movie down the line? His producing partner and friend Hiram Garcia says Johnson takes it very seriously and began considering it more earnestly after the 2016 election. "People called for Dwayne to run for president, and as that sentiment started to build up, he really started to respond to it and seriously thought about it. Dwayne really does care about the people, and he has great respect for the position that it requires and holds. Whenever we talk about him running for president, he's very aware of the position and knows what is required of it, and he doesn't like to speak loosely about it 'cause he respects the job, and respects the people and what it took to get there." Previously, Dwayne Johnson said that his schedule would likely prevent him from a 2020 run. Though, he hinted that a 2024 run wouldn't be out of the question. We'll have to see if that ultimately pans out. For now, The Rock is going to strike while the iron is hot and will keep doing his thing on the big screen. This news comes to us courtesy of Vanity Fair.